The QUINTESSENTIAL Country Estate! Truly one of the most PRIVATE settings 14+/- Acres of Pristine grounds on Winding Mulberry Creek, perfect for Equestrian or Livestock. Meticulously maintained Property includes Main Home, Guest Home, 4-Stall Barn w/Full BA, 6 Car Garage. 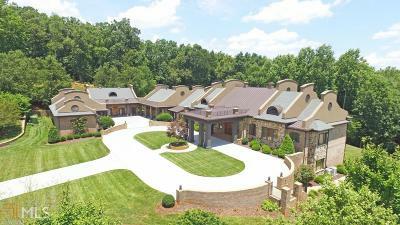 15 min to Chateau Elan/1 HR to ATL Airport. Unmatched Craftmanship finishes defines this vast, comfortable Estate. Boasting an Open Flrplan for Entertaining, Elevator, Chefs Kit, Outdoor Spaces Inc: Expansive Cov Porch w/FP & Kit, Gunite Pool, B-Ball/V-Ball Court & Nature Trail leads to Water Fall. Directions: I-985 N, Exit 12, Right On Spout Springs, Left On Hog Mtn, Right On Falcon Pkwy, Right On Jm Turk Rd, 1.5 Miles On Left, See Private Sign & Row Of Mailboxes, Left On 1st Private Dr On Left, Home @ End Of Street, No Sign.